Crimson Trace LG-852 Laser Grips For Glock Gen4 26 27 33 FREE SHIPPING! 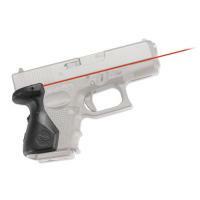 This Crimson Trace Lasergrip® is engineered to work with the fourth-generation Glock pistol. A game-changer for tactical professionals, the grip activates from the rear when held naturally by the palm, eliminating fumbling for switches or buttons. Housed in a durable polymer frame with rubber overmold, the red .5 inch laser is factory sighted up to 50 feet. The laser adjusts to changes in windage and elevation. With a pair of two #2020 batteries, the laser offers a run time of over four hours. Easily install without the need of a gunsmith. ©2002-2019 CopsPlus.com: Crimson Trace LG-852 Laser Grips For Glock Gen4 26 27 33 FREE SHIPPING!